Just Thinking: Learning to live with blessings and courses! Learning to live with blessings and courses! As someone who embraces technology and has used it throughout my adult life, I recognize that it follows the pattern established by God in Deuteronomy where he places both blessings and curses in our paths. With every new blessing there are ways we can use them that bring on curses! The blessings of technology are easy to spot. Access to so much information, staying in contact with people, creating virtual communities...so much good. What could be the curses? They are the curses of unintended consequences. People who connect only with people who present a single side of a story --- people who concentrate and increase the separation among people in our country. Our children more than any other generation have lost touch with reality. The spend so much time in virtual worlds that they lose touch with the real world that surrounds us. They do not know how to observe nature, they don't know where their food comes from or how the earth nourishes us. They perhaps don't even experience real depth of relationships, because they spend so much time in virtual relationships. I cannot stop or change the technology, but I can encourage experiences that let them be touched by that which is real, even as I encourage them to use the tools of technology! 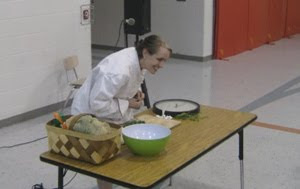 Martha Stamps, cookbook author, newspaper columnist, and chef, visited Westmeade on Friday. Nearly 80 children got to watch a real chef turn a few healthy ingredients into a great after school treat. Vegetables from a real garden don't wait --- so even though the event was fraught with incredible difficulty, she was there at 2:00 in the afternoon to make a difference! Timing was bad for her --- (she was in the midst of a move) --- because of this fact she had trouble getting my phone messages and I didn't get her email until late Thursday night (she had sent the message to my daughter whose email address is quite similar to mine but, thankfully, Noelle had forwarded it to me). When I left home Friday --- I walked off without the cucumbers that had been in the refrigerator waiting for her! But not to be stopped by the lack of a significant ingredient --- I hopped in my car and in 15 minutes flat had organic cucumbers ready for her....She had been preparing the other tasty ingredients and didn't miss a step....I washed them up....and returned to help "strip" them and carve out their centers to make an edible bowl for the delicious heirloom tomatoes, herbs and spices! As I helped her carry out the remaining ingredients to the car, a warm and gentle rain began falling. We finished loading the car and I watched as this lovely woman drove off to her own family. I stepped back into school to do my "car duty." Where children were eager to tell me about what they had seen. As if I had not been there, they shared the story of the lady who came and fixed "salsa" in cucumber cups!